Bradley Beat speaking at NBA Crossover with Allie LaForce on NBA fashion and pop culture. Jack Daniel’s gave fans free haircuts and a special virtual reality experience at the NBA Crossover. EA Sports pit fans against one another to in NBA Live 18. Kyle Kuzma’s and Jayson Tatum’s trading rookie trading cards were on display at NBA Crossover. NBA on TNT brought celebrity guest appearances including Lil Uzi Vert to perform during the show. Fans had their championship photo taken next to the Larry O’Brien Championship Trophy. Look, but don’t touch. Brothers Jason (left) and Zach (right) competed head-to-head in NBA Live 18 at the EA booth. Have your picture taken as you fall into a sea of foam fingers at NBA Crossover. NBA on TNT Road Show (Thursday-Sunday): Get a firsthand look at the NBA on TNT with Ernie Johnson, Charles Barkley, Kenny Smith and Shaquille O’Neal. The space included free concerts like Kendrick Lamar and Lil Uzi Vert, basketball activities and photo opportunities with the guys. This event is free and open to the public during specific hours. 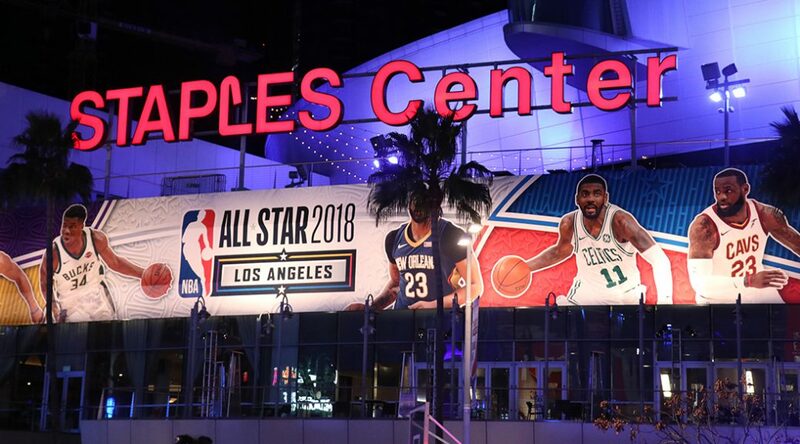 NBA Crossover (Friday-Saturday): This blend of entertainment, fashion, art and video gaming showcases the impact the NBA has made in pop culture with guest appearances from NBA All-Stars and other celebrity guests. This event is free and open to the public. Rising Stars Challenge (Friday): The NBA’s top rookies and second-year players face off in a warmup match to the weekend’s big event Sunday. This year’s tickets range from $10 – $250. Media Day (Saturday): For the first time in All-Star history, Media Day was open to the public as fans can watch their favorite players in the hot seat answering questions from reporters. Tickets cost $10. NBA G League International Challenge (Sunday): The minor league stars leave Twitch and join NBA TV for an early evening that takes place before the All-Star Game. Tickets range from $10 – $20. Los Angeles’ Staples Center awaiting the arrival of fans from across the country. (Jourdan Kerl/MEDILL). Previous PostBen Simmons picked by NBA Rising Stars to be the next All-StarNext PostLike father, like son: The NBA dunk contest is a family affair for Larry Nance Jr.